Solar boat makes its way across Atlantic Coast | West Coast Solar, Inc. The MS Toranus PlanetSolar, a catamaran powered by solar energy cells, is making a stop in Boston this week as it navigates its way along the Atlantic Coast. The boat is being used to carry out research to determine the effect of climate change on the Earth’s oceans. It was designed by a team of engineers and scientists from New Zealand, who wanted to promote the use of renewable energy and alternative fuel sources for creating a vehicle the can remain at sea indefinitely. Its trip along the eastern seaboard is meant to highlight advancement in solar cell technology while also bringing greater attention to the issue of anthropogenic climate change. The climate and oceanographic research is being carried out by faculty members from the University of Geneva in Switzerland. 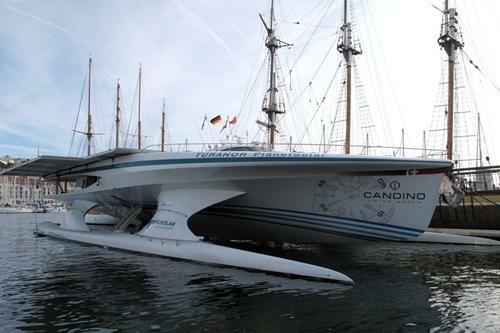 The boat is powered by solar panels that are 75 feet wide and 115 feet long. The 29,160 solar cells on board provide a generative capacity of 93.5 kilowatts of electrical power, allowing the vessel to reach speeds of up to five knots (5.75 miles per hour). The stop in Boston, which is being supported and promoted by swissnex, a Boston organization meant to foster positive relationships between scientists and innovators, is the latest layover in a trip that has taken the boat to New York and Baltimore. Hopefully, the Toranus PlanetSolar will make its way over to the California coast soon. But you need not wait for it to experience the benefits of Northern California solar power. Contact West Coast Solar today to find out how your home or business can take advantage of this clean, renewable energy technology.